Golden Guide to Your Retirement Planning! What are the thoughts that come to your mind when you hear the word ‘retirement’? Is it you travelling often? Or probably just playing around with your grandchildren? However, some people may think about retirement, while few youngsters may ignore. Well, Planning for retirement or any investment doesn’t need any age because it's only to secure your future! When it comes to retirement planning, smart and early plans can build enough money to live off a comfortable life after you get retired. If you haven’t thought about retirement planning, start doing it now! Here are a few golden steps that you need to follow to start your retirement planning. Also, know the pension plans available in India and accordingly make the best retirement plan! Having a perfect retired life comes with proper planning and execution. ‘Right planning and right investment’, is what matters the most! However, every person has a different lifestyle with different requirements. That is why, you should first draw a personalised plan in accordance with your requirements, lifestyle, at what age you want to retire and your annual earnings. Evaluate your monthly expenses, this will give you an idea about your spending in terms of both important and unnecessary things. This will also draw you to a line where you can figure how much you can save every month. Retirement planning is considered to be an important task in life. The earlier you think about post-retirement and start saving for it, the sooner you will be able to live a stress-free life. 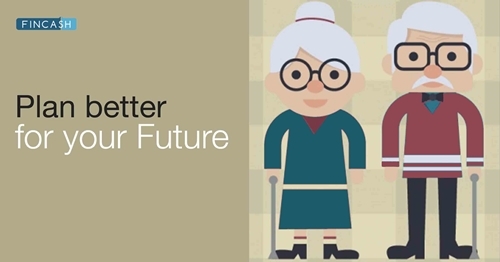 Planning for your retirement as per your age is considered to be the best way. Here are some tips that you need to follow. To initiate your retiring plan, you could start exploring retirement benefits offered by your company. You can sign-up for the Employees’ Provident Fund (EPF). 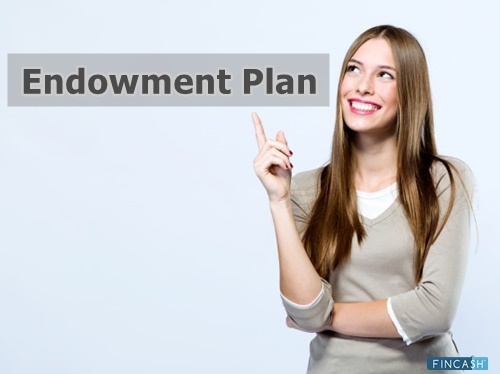 EPF is a retirement scheme wherein your employer deposits a certain amount every month in an EPF account and this is deducted from your pay cheque. The fund is maintained by the Employees Provident Fund Organisation of India (EPFO). At every stage of retirement planning, you should hold a portfolio of various assets in your corpus. The portfolio typically contains stocks, fixed income instruments, and cash assets. In your 20’s you could make a long-term Investment plan either in more risk taking assets like equity or in less of risk assets like cash, FDs, etc. Moreover, Investing early for your retirement allows you to enjoy the benefits of compound interest. Compound interest can boost your contribution over the long-run as it will make your account grow at a faster rate than it could with simple interest alone. You can also create your own personal retirement saving plans by putting aside at least 10% of your annual income into a retirement account. Apart from this, you need to curb your spendings. Be it retirement planning or any investment, 20’s is a right age to start with. It's also a good time to get into the habit of creating a tight budget which will help you to spend less and save more. If you have followed your 20’s practice for retirement planning, then you might have a clear understanding about your further plans too. Well, 30’s is the time when you have higher responsibilities of family and hence, you have to plan your investments accordingly. During 30’s, as part of your retirement planning, you can add short-term investments into your Asset Allocation. Moreover, you can set up your portfolio based on the target date of your retirement. At this age, you should buy health insurance and also provide your family with Life Insurance. Start knowing about different investing and saving options that you could enroll into. During this time period, you should also create an emergency fund, via a Fixed Deposit account which can be removed at any point of time and is interest-free. Make sure that you keep yourself free from debt and save more. This is the time when you are well settled and have enough savings & assets. But, at this phase of life, you will also be more occupied with your children’s responsibilities. Well, as part of your retirement planning in 40's, make sure that you pay off all your debts and keep yourself free from liabilities. However, don’t stop contributing to your retirement account, continue doing that. A mistake people often do at this age is they tend to use their retirement fund. Avoid this strictly as you may end up depleting your retirement kitty, which will also affect your years of hard work of retirement planning and savings. This is the time when most people will be earning at a good pay scale and might be moving ahead of certain responsibilities like child’s education, which will give a good support to your retirement savings and investments. If you are planning to invest at this point in your life then invest in low-risk instruments with a higher liquidity quotient. When you reach your 50's, you should gradually lower down your stock allocation and increase your fixed income investments. If your investment is at maturity stage by now, and if you want to reinvest those funds into another instrument, consider tax implications, risks, and liquidity of the particular instrument. During this age, you have to be very particular about keeping a track on your investments. During your 60's, if you get retired then your retirement planning will be put into action. While you are just near to your retired life you can sing-up to schemes that have low risks, high on liquidity or carry low-interest rate risk. Choose payout options based on how frequently you would need money. Retirement calculator is one of the ideal ways to estimate how much money you would need to save post-retirement. While using this calculator you would need to fill variables like current age, planned retirement age, regular expenses, Inflation rate and the expected long-term growth rate on investments (or equity markets etc.). The sum of all these variables will help you to calculate the amount that you would need to save monthly. This amount will give you the money needed post-retirement given certain assumptions. An investor can deposit a minimum of INR 500 per month or INR 6000 yearly, making it as one of the most convenient forms of investment for Indian citizens. 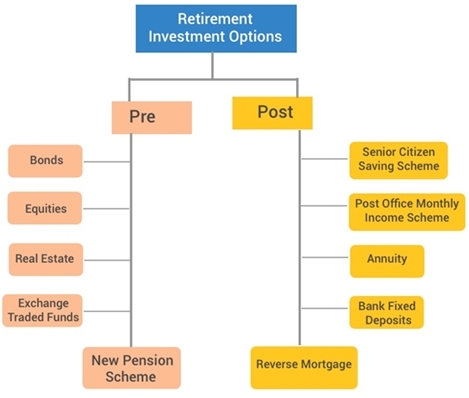 Investors can consider NPS as a good idea for their Early retirement planning because there is no direct tax exemption during the time of withdrawal as the amount is tax-free as per Income Tax Act, 1961. Under an Employee Provident Fund, employees, as well as the employer contribute a certain amount from their basic salary (approx. 12%) in an EPF account. The entire 12% of your basic salary is invested in an Employee Provident Fund. Out of 12% of the basic salary, 3.67% is invested in an Employee Provident Fund or EPF and the remaining 8.33% is diverted to your EPS or Employee’s Pension Scheme. Therefore, Employee Provident Fund is one of the best saving platforms that enable employees to save a part of their salary every month and use it after retirement. Investors who have a high-risk appetite can consider investing in equities. Investors can choose from a host of option such as Large cap funds, mid & small cap and thematic funds. Large-cap funds carry low risks compared to mid-cap and thematic funds. Since thematic funds give exposure to a specific industry, they carry the highest risks amongst all equity Mutual Funds. Investors planning to invest in Equity Funds as part of their retirement planning are advised to stay for a longer period of time i.e., more than 5- 10 years. Bonds are one of the most popular Retirement investment options. A bond is a debt security where the buyer/holder initially pays the principal amount for buying the bond from the issuer. The issuer of the bond then pays the holder an interest at regular intervals and also pays the principal amount at the maturity date. Some of the bonds provide good 10-20% p.a. rate of interest. Also, there is no tax applicable on bonds at the time of investment. As these funds invest most of the money in debt instruments such as government securities, corporate bonds, money market instruments etc., they are considered to be a relatively safer investment than equity. However, there are risks to investing in Debt fund too. Whether your aim is to have a 'lavish retired life or a simple one' you have to reach them! For that, every investor should build few personality traits. So, before you start your retirement planning, look at the few important and basic traits that you need to develop and bring into a routine right now! Planning for retirement not only means to be financially secure, but it also means to plan according to these mentioned life stage goals. Provide yourself with necessities along with a strong financial backup for uncertain events in life. For that retirement planning has to be very active, smart and systematic. For a healthy, wealthy and peaceful retired life, start your retirement planning now! ☆☆☆☆☆ Rated 4.5, based on 38 reviews.